Fauré’s late, lyrical, lilting D minor Trio receives committed playing marked by an emotional and musical intelligence. Admirers of the Fidelio Trio’s earlier Resonus coupling of Ravel and Saint-Saëns (reviewed 9 January 2017) will need no urging to investigate this enchanting follow-up featuring a quartet of French piano trios. Chausson’s aching, ardent G minor Trio is realised with exquisite feeling, Darragh Morgan’s keening violin in the third movement delectably dark and a thing of brittle beauty. There’s wholly simpatico support from Mary Dullea’s liquid piano and Adi Tal’s burnished cello throughout, intoxicatingly so in the buoyant finale. 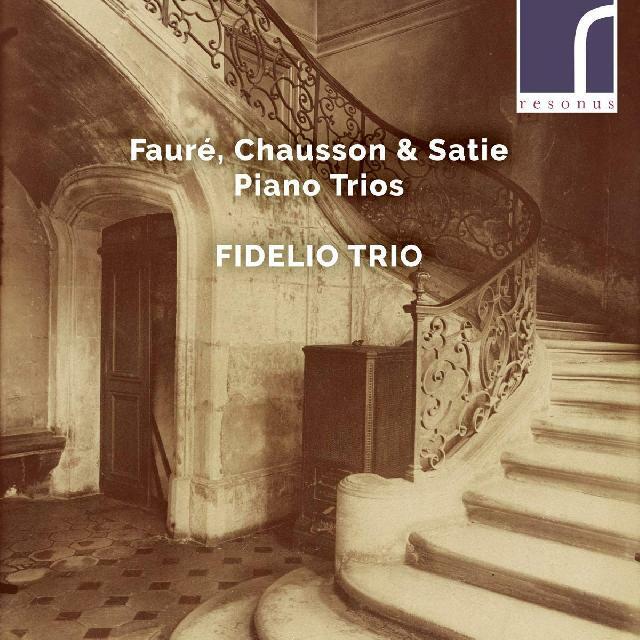 Fauré’s late, lyrical, lilting D minor Trio receives committed playing marked by an emotional and musical intelligence to favourably compare with the Florestan Trio on Hyperion. The arrangements of an excerpt from Satie’s incidental music to his play Le Piège de Méduse and Messe des Pauvres by John White (who provides rewarding booklet notes and whose accounts of Satie’s piano works on Arte Nova are worth exploring) retain the spiky succulence of the originals in performances of adroitly measured and meticulous poise.